Our parish-wide athletic program is first and foremost an extension of our Catholic educational experience with a goal of providing wholesome and enjoyable use of extra-curricular time by our children through sports activities, while also teaching sport fundamentals, developing athletic skills, instilling self-worth, discipline and judgment, fostering good sportsmanship and, winning with grace and losing with dignity. We currently offer boys' and girls' volleyball, basketball, track & field and girls' softball to all our 5th - 8th grade school and religious education students and CYM volleyball and basketball to 9th - 12th grade Catholic high school or religious education students from our parish families. 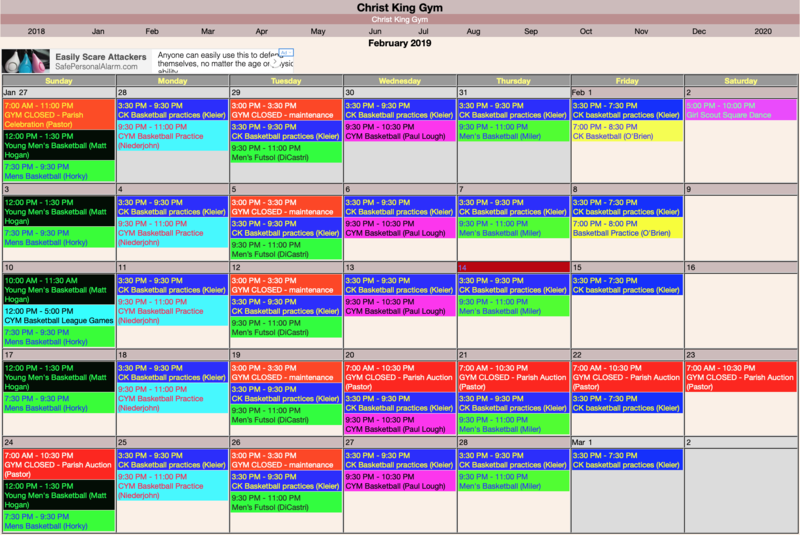 We also open our gym doors to a few weekly adult male basketball and futsal parent/parishioner recreational groups, when time and space allow. Families pay fees for child(ren) to participate in our sports and, in doing so, become members of the overall Athletic Association. We in turn look to them to volunteer in positions as involved and rewarding as coaching or serving on the Athletic Committee (managing body of the Association) to other less time intensive roles as general gym duty, fundraising and more! As a Catholic parish-based athletic program we continually strive for a healthy and respectful level of spirited Christian competition. We adhere to the guidelines set forth by the Archdiocese as well as our own Handbook and Student/Parent Code of Conduct. These guidelines, along with our parent/parisioner volunteers and role-models, serve as key factors in keeping our program a vibrant and positive place for our children to play, develop and grow as a faith-filled community. Make Your Dr. Cary Cavalier Spirit Award Nominations NOW! Jim Gosz Summer Volleyball & Basketball Co-Ed Camps - Register Now! Download the Basketball Registration Form HERE. Please Support & Thank Our 2018/19 CKAA Sponsors! If you are interested in learning more about these positions, please contact Ken Hemauer, our Athletic Board Director. All students participating in athletics must have this form on file prior to practice or participation.